The Model 5000A250A is a self-contained, air-cooled, broadband, completely solid state amplifier designed for applications where instantaneous bandwidth and high gain are required. Push-pull MOSFET circuitry is utilized in all high power stages in the interest of lowering distortion and improving stability. The Model 5000A250A, when used with an RF sweep generator, will provide a minimum of 5000 watts of swept power. The Model 5000A250A is equipped with a Digital Control Panel (DCP) that provides both local and remote control of the amplifier. The DCP uses a 3 3/4 inch diagonal graphic display, menu assigned softkeys, a single rotary knob, and four dedicated switches (POWER, STANDBY, OPERATE and FAULT/RESET) to offer extensive control and status reporting capability. The display provides operational presentation of Forward Power and Reflected Power plus control status and reports of internal amplifier status. Special features include a gain control, internal/external automatic level control (ALC) with front panel control of the ALC threshold, pulse input capability and RF output level protection. Also included is an internal RF detector which provides an output for use in self-testing or operational modes. 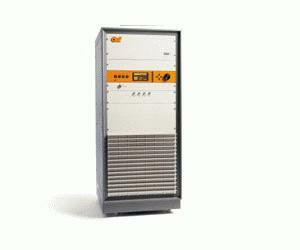 All amplifier control functions and status indications are available remotely in GPIB / IEEE-488 format. The buss interface connector is located on the back panel and positive control of local or remote operation is assured by a keylock on the front panel of the amplifier. High efficiency universal input, power factor corrected switching power supplies provides DC to all internal subassemblies. Housed in a stylish, contemporary enclosure, the Model 5000A250A provides readily available RF power for typical applications such as RF susceptibility testing, antenna and component testing, watt meter calibration, particle accelerators, plasma generation, communications and use as a driver for higher power amplifiers.